Super Monkey Ball: Touch & Roll has a simple, effective setup. While the menu options aren't labeled until you click on them, "Multiplayer" is one of the options on the main menu and "DS Download Play" is located in the Multiplayer menu. There isn't a forced opening credits sequence - just a really disturbing monkey showing you its rear end with an equally disturbing "Touch me!" on the screen. Seriously. No joke. The game features a segmented download, with the menu downloading in about 20 seconds and each game downloading (when selected) in about a minute. I'd like to specifically praise the programmers for their decision to download the games separately. By doing this, each downloaded game can be bigger in size and more in-depth in play. I hope that more games follow this example so that their Single-Card Download content can be improved. All of the tapable areas within the menu system are large and are well-separated, preventing the accidental tapping of the wrong options. Options also need to be double-tapped, which further prevents accidents. The menu system is already unlocked, as are all three playable mini games. Monkey Race's game play is simple and accurate. You've got to make sure you don't bounce off the track, but that's a matter of each player's ability. The faster you go, the harder the monkey is to control - just as it should be. Monkey Hockey is extremely flawed. Whether you want to or not, it will be a two-on-two match, with computer characters filling in when there aren't enough people. The problem is that the computer characters are extremely aggressive and can mess up your shots. Monkey Wars is probably the best of the mini games. It's easy to play and fun. It's also the most balanced. The graphics are 3D in Monkey Race, 2D in Monkey Hockey, and a 2D/3D combination in Monkey Wars, with each style being appropriate to its respective game. The sound is appropriate and, in the case of Monkey Wars in particular, occasionally helpful. While there are no options to select from in either of the three games, there are three games to choose from. Unfortunately, the programmers made a really annoying decision with the games that are not playable in Single-Card Download play. I wasn't so much bothered by the fact that they were on the menu (it gives the guests a chance to see what other features they get for buying the game for themselves). What really bothered me was the fact that those unplayable games just had a giant "X" over their images. They didn't use a label saying "Buy the game to play these." or "Not active in this mode." - just a gaint "X" over them. This choice, while having the same in-game effect, almost comes across as a punishement or, at the very least, implies that these games are unlockable, which they are not. Video game players aren't stupid and they know that the publishers want to sell more games, so saying "Buy this for more features" wouldn't offend anyone (or, at least, anyone intelligent). My feelings on Super Monkey Ball: Touch & Roll are mixed. Monkey Wars was fun. Monkey Hockey was extremely frustrating (as a two-player game especially). Monkey Race was somewhere in between (it more leaned toward fun, but it's hard to be impartial after having played Mario Kart DS). The impression I got, however right or wrong it might be, was that different programmers created the different games with little oversight other than whether or not they work. Whether I'm right about that or not, there's a much bigger difficulty and enjoyment discrepency between the mini games than I've seen before. If you decide to pick up the title and play the Single-Card Download play mini games, try them each for yourself, but I think you'll enjoy Monkey Wars better than the others. I know I'll be playing Monkey Wars again (I'm not sure about the others). In the meantime, if a few minor things can be fixed, I'm very much looking forward to the next Super Monkey Ball game for the Nintendo DS. Don't force in a computer player in Monkey Hockey unless there are three players. Don't label the unplayable games with just a giant "X" over their icons. Allow for the selection of settings in the games prior to download. 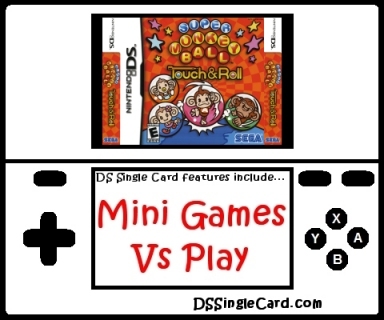 Click here to return to the DSSingleCard.com Super Monkey Ball: Touch & Roll profile.